Ivatt strongly believed that a locomotive's success depended on its capacity to boil water, hence he gave the C1s a large (for the time) boiler and firebox. Although the boiler was large, there was not a corresponding increase in cylinder size and the C1 retained the 18.75in x 24in cylinders of the C2 Klondykes. No. 251 had the same springs as the C2 Klondike, but the heavier design resulted in an uncomfortable ride. Longer springs were quickly fitted. Twenty more C1s were built in 1904, but the initial performance was a disappointment. The wide firebox left no space for screw reversing gear, so a lever operated mechanism was used instead. Unfortunately this was hard to operate, especially at speed. Also, drivers tended to handle the locomotives in a conservative manner due to restricting valve timings leading to a tendency to use a lot of water. Between 1905 and 1908, sixty large-boilered C1s were built with simple expansion. These locomotives replaced the lever reversing gear with a screw reverse which was assisted by air pressure. The firebox had to be slightly re-designed so that there was enough room to fit the screw reverse. Ivatt took advantage of this needed re-design, and deepened the firebox at the front. The greater slope helped to shake coal to the front, aiding firing. Earlier locomotives needed their frames altering to take boilers with this deeper firebox. Alterations started in 1925 and were completed in 1933. Ivatt's last development was the fitting of piston valves and Schmidt superheaters to the last ten C1s built in 1910. The addition of a superheater was matched with an increase in cylinder size from 18.75in to 20in diameter. At the time, superheating was viewed as a method to decrease the boiler pressure. Hence, the working pressure was decreased from 175psi to 150psi. Due to poor performance, Ivatt built a four-cylinder compound version (No. 292) in March 1905. The outside cylinders drove the trailing coupled axle, whilst the inside cylinders drove the leading coupled axle. Walschaerts valve gear was used on the outside cylinders, but the inside cylinders were fitted with Stephenson valve gear. A valve was fitted beneath the smokebox, which switched the locomotive from simple to compound working. This was controlled from the cab, enabling a driver to switch between simple and compound working. The boiler was built to operate at 225psi, but actually operated at 200psi. No evidence has been found to suggest that 225psi was ever used. Between 1910 and 1912, a standard 175psi Atlantic boiler was fitted whilst repairs were being made to the original high pressure boiler. No. 292 (LNER No. 3292) was never superheated, and was withdrawn from service in August 1928. The boiler was equipped with a 24-element Robinson superheater and fitted to the four cylinder simple engine No. 3279 (see below). The GNR directors were not satisfied either, and a second four-cylinder compound (No. 1300) was built in July 1905. This was built by Vulcan Foundry after the GNR approached five companies with broad specifications. The layout was similar to No. 292, with the high pressure cylinders on the outside, and a divided drive. The boiler had a working pressure of 200psi. Due to various troubles in the first few thousand miles, No. 1300 quickly acquired a bad reputation. Comparative trials between No. 1300, No. 292, and the simple No. 296, showed that No. 292 had the best coal consumption, but No. 294 had a lower oil consumption due to it having only two cylinders. In 1914, No. 1300 was fitted with a Robinson 22-element superheater,and the smokebox was lengthened by 9in. The working pressure is believed to have been reduced to 175psi, although the engine diagram continued to show a working pressure of 200psi. Performance was still unsatisfactory, so when No. 1300 suffered from a fractured cylinder in 1917, the opportunity was taken to rebuild it as a two-cylinder simple engine. New front-end frames were required, but the non-standard boiler was kept. No. 1300 continued to perform poorly and was withdrawn in October 1924 having only run 390,798 miles. This compares to C1 Nos. 1407-9 which all managed over 625,000 miles each over the same period. No. 1421 was the last of Ivatt's C1 compound locomotives, and incorporated features from both Nos. 292 and 1300. No. 292's layout of cylinders and valve gear was used, but the Stephenson valve gear on the inside was replaced with Walschaerts valve gear. The slide valves were positioned slightly differently, allowing the inside cylinders to be increased in diameter to 18in. The boiler pressure was 200psi. Although no tests are known about, No. 1421 had a reputation of being a better performer than No. 292 although it also suffered from various problems. 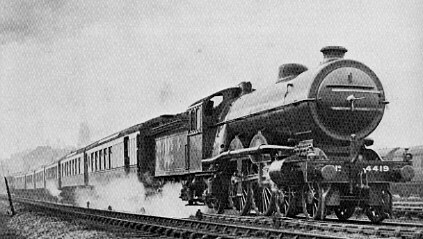 Gresley was the first to modify No. 1421, by adding a 22-element Robinson superheater in 1914. It was rebuilt a second time in 1920, as a standard C1 Atlantic with a 24-element Robinson superheater and piston valves. Gresley succeeded Ivatt in 1911, and built no further Atlantics. However, he continued to make improvements to the C1 class, and the fact that the original 1902 Klondyke design was capable of so many improvements, delayed the need for the GN to invest in new express passenger locomotives until the early 1920s when Gresley introduced his acclaimed A1 Pacific locomotives. Between 1914 and 1915, five saturated locomotives had Schmidt superheaters fitted. In 1914, No. 1442 was fitted with a 24-element Robinson superheater, and shortly afterwards Gresley ordered that no further Schmidt superheaters should be obtained. Robinson superheaters were gradually fitted to saturated locomotives, with the last conversion occurring in 1926. Schmidt superheaters were replaced with the Robinson type, as they wore out. The last was converted in 1927. The LNER slowly replaced 24-element Robinson superheaters with the 32-element Robinson type. The last of these replacements occurred in 1934. It is generally acknowledged that the C1s performed their best work when fitted with the 32-element Robinson superheater. In 1914, Gresley rebuilt No. 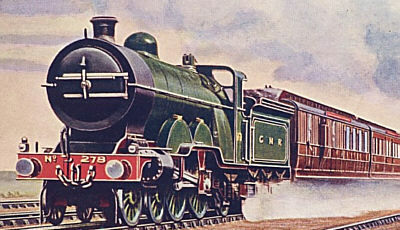 279 (LNER No. 3279) with four 15in diameter cylinders using simple expansion. A new front end was fitted. All four cylinders drove the rear coupled axle. A second-hand boiler was fitted. This had a 24-element Robinson superheater fitted, and the boiler pressure was reduced from 175psi to 170psi. The boiler needed replacing in 1928, so the boiler from No. 3292 (withdrawn in January 1927) was fitted. A completely new boiler was fitted in 1932, with a deep firebox, 32-element superheater, and Ross pop safety valves. A final rebuilt occurred in 1937, when it was decided to convert No. 3279 as a two cylinder locomotive with K2-pattern (20in x 26in) cylinders and modern steam passages. No. 3279 was involved in coal consumption tests alongside Thompson B1 No. 8301 Springbok in 1944. On heavier loads, the B1 had a slight economy advantage over No. 3279. After Grouping, trials were performed between No. 1447 and Atlantics from the North Eastern Railway (NER) and the North British Railway (NBR). For these trials, No. 1447 had an arch-roofed cab fitted so that it would fit within the NBR loading gauge. Four 3in diameter Ramsbottom safety valves were fitted as standard during GNR ownership. These were gradually replaced with two 3in diameter Ross pop safety valves after 1923. A couple of C1s would keep their Ramsbottom valves until withdrawal. Ivatt's standard bogie design was used. Due to recurring fractures, these were replaced with a strengthened type from 1909. In 1934, there was a plan to replace them with side control springs, as used on the Gresley Pacifics at that time. This plan was dropped due to cost, and the fact that the C1 bogies gave little trouble. In 1923, No. 1419 (LNER No. 4419) was fitted with a booster to increase the tractive effort when starting a heavy load and on steep gradients. In theory, the booster could improve the tractive effort by about 50 percent. The booster was a small two-cylinder engine incorporated in the trailing pony truck, which could be engaged with gears when required. A Westinghouse pump was fitted to operate the gear engagement with compressed air. The cylinders were 10in x 12in and were connected to the axle with gears of total ratio 36:14. Tractive effort at 71.5 percent, was quoted as 8,500lb. The booster performed well during initial trials, although boiler pressure was observed to drop quickly when the booster was in operation. This was due to the booster exhaust choking the main exhaust, resulting in no sharp blast in the smokebox. Although the starting power was increased greatly, slipping would occur if full steam pressure was applied. Over the next five years, various changes were made. In August 1923, steam-operated sanding gear was added to the booster wheels to stop the slipping. In March 1924, a new blastpipe arrangement was fitted but with mixed results. In April 1924, a shorter chimney and low dome were fitted so that No. 4419 could run on NER and NBR track. After trials in the West Auckland area, the Westinghouse pump and booster were removed for seven months to allow for modifications. The booster was refitted in February 1925, and incorporated a new gear ratio of 36:24 to allow faster running with the booster engaged. This would also increase the adhesion and reduce slipping. The control system was changed for a steam system, and the Westinghouse pump was not refitted. Another new blastpipe arrangement was fitted. After these changes, No. 4419 performed much better in the tests. Steaming was much better with the new blastpipe arrangement, and the steam control mechanism meant the booster could be engaged in five seconds (compared to fifteen seconds for the air system). With these successes, No. 4419 entered service in February 1926 pulling the Pullman service between Leeds and London. Although the booster functioned well, reports started to appear of bad riding. Brasses in the booster axleboxes frequently broke. Unfortunately the original booster design had no allowance for spring suspension, and there was now no room for helical or leaf springs to be fitted. Concentric rubber springs between the booster casing and the engine cross strut, were fitted in November 1926. In 1927, tests were performed over the Waverley Route. Although the booster would be useful for starting trains anywhere on the route, it could not be used at the speeds required to keep to the current timetable. In June 1927, No. 4419 was back to the Leeds Pullman service, but reports of poor riding returned. Checks were made in August, and the rubber springs were found to have perished. Larger rubber springs were fitted, but these do not appear to have improved matters very much. The booster was dismantled in November 1935, and the steam sanding gear was removed. The booster cylinders were fitted to P1 No. 2393 in February 1937. The first C1s immediately began working the principal GNR expresses, displacing the Stirling Singles to other duties. By 1912, the C1s were divided between Kings Cross, New England, Grantham and Doncaster. No. 1442 was chosen as the GNR's Royal engine in 1908, and was given replicas of the GNR's coat of arms as well as burnished fittings. It hauled King Edward VII's train from London to Leeds on 7th July 1908, and in 1909 was exhibited at the Imperial International Exhibition at White City, London. During June 1909, a series of exchange trials took place between the C1s and the London North Western Railway's (LNWR) 'Precursor' class 4-4-0s. The C1s showed a small coal economy over the Precursors. Generally speaking, in their early days the C1s did not perform quite as well as expected, especially when hauling heavier trains. This became a greater concern from 1916 when war conditions caused train loads to increase to 500 tons. After a number of incidents of C1s stalling in the tunnels just north of Kings Cross, a 4-4-0 pilot was provided for trains over 450 tons in weight between Kings Cross and Potters Bar. Shortly after Grouping, the LNER introduced the Harrogate Pullman from Kings Cross to Newcastle via Leeds, Harrogate, and Ripon. This started in June 1923, and Kings Cross C1s were used to haul the Kings Cross to Leeds section. In September 1925, the Harrogate Pullman ran all the way to Edinburgh, using the Church Fenton, Tadcaster, and Wetherby route to Harrogate. B3 4-6-0s were initially used south of Harrogate, but C1s were used from March 1927. D11 'Directors' were allocated to Copley Hill to help with the Harrogate Pullman and the West Riding Pullman services. From 1932, a large effort was made to speed up the principal express services. Although the Copley Hill D11 'Directors' did well, they were unable to match the speeds achieved by the Kings Cross C1s, so C1s were allocated to Copley Hill to haul Pullman services. With the advent of the A4 Pacific hauled Silver Jubilee service in 1935, the West Riding Pullman terminated at Harrogate rather than Newcastle. Despite this, the train grew to nine coaches and the C1s began to have difficulty. From 1937, A4 Pacifics were used instead, and C1s were only used when there was a shortage of A3 and A4 Pacifics. Many of the C1s were moved to Sheffield. These tended to be in a run-down condition and at first were not very popular. After overhauls at Doncaster, the C1s quickly became a favourite type with Sheffield crews. Sheffield C1s worked passenger services to Liverpool, Manchester, York, Leicester, and even Swindon via GWR track. From 1928, Cambridge also received an allocation of C1s for passenger expresses. These were speeded up in 1932 and marketed as "Garden Cities and Cambridge Buffet Expresses", although they were quickly dubbed "Beer Trains". C2s, B12s, and Clauds also worked these services alongside the C1s. The C1s were restricted from running on most of the GE (Great Eastern) network, but the Cambridge C1s were allowed to haul race specials to Newmarket. Even in the 1930s, the C1s were capable of feats despite their age. A notable run occurred in July 1936 and was recorded by Cecil J. Allen who said he wouldn't have believed his timings if someone had sent them to him. On at least three occasions he had to check that a second locomotive had not been added. The train was a large train of seventeen coaches and 585 tons running from Kings Cross to Edinburgh. The scheduled A3 failed at Grantham and was replaced by the Grantham pilot, C1. No. 4404. No. 4404 was 31 years old and not in the peak of condition. It was driven by R. Walker, who reportedly was not very experienced with the C1 class. No. 4404 took three attempts to start the train, but managed to reach Selby in 67 minutes and 41 seconds. Over sixty miles had been covered at an average of 64mph. A slow finish brought the train into York at 87 minutes 40 seconds, versus a schedule of 90 minutes. Over two minutes were taken off the schedule when the circumstances would have justified a late arrival of 20 minutes or more! During wartime, the C1s were seen more often north of York, and occasionally they were seen north of Newcastle. Wartime shortages of staff, materials, and spare parts took their toll on the C1s and their condition deteriorated quickly. Withdrawal of the standard C1s started in 1943, and speeded up with the post-war production of Thompson B1s. Seventeen C1s survived into BR ownership (1948). The last C1 was withdrawn in November 1950. The very first C1, No. 251, has survived into preservation. The C1 class experienced a high degree of development, resulting in five different cylinder arrangements, and four different superheater arrangements, during their time with the LNER. Hence, the boiler parameters have been listed in a separate table to the main locomotive parameters. The LNER never issued a diagram for the remaining saturated C1s and these are not listed here. The tractive effort for No. 3292 is for when it was operating in as a simple (non-compound) expansion engine. Cylinders: 2 outside: 19x24in. 20x24in. 13x20in. (HP) 15x26in. 20x26in. 2 inside: 16x26in. (LP) 15x26in. The 22 element superheater was fitted to locomotive No. 1300. Heating Surface: Total: 2450 sq.ft. 2533 sq.ft. 2559 sq.ft. 1814 sq.ft. Firebox: 141 sq.ft. 141 sq.ft. 141 sq.ft. 167 sq.ft. Superheater: 427 sq.ft. 568 sq.ft. 410 sq.ft. 280 sq.ft. Grate Area: 31 sq.ft. 31 sq.ft. 31 sq.ft. 31 sq.ft. No. 2800 (pre-1946: No. 3251) was withdrawn in July 1947 and was restored to an external GNR condition complete with its original number of 251. This included the replacement of the superheater, piston valve cylinders, Ross pop safety valves, and mechanical lubricators. The replacement slide valve cylinders were taken from No. 2868, and the saturated boiler was taken from No. 3278. A new frame was fitted, probably from No. 2868. After this restoration, it was exhibited at Kings Cross in October 1952 as a part of the station's centenary. In 1953 it was steamed for a series of specials celebrating the centenary of Doncaster Works. The restored No. 251 exhibited poor steaming due to its saturated boiler that still retained the flues from a previous superheater. Hence, these specials were piloted by C2 No. 990 Henry Oakley. In 1954, No. 251 hauled more specials, this time it was often helped by D11 No. 62663 Prince Albert"
After a visit to the Doncaster Paint Shop, No. 251 entered the York Museum in March 1957. It was then transferred to the new National Railway Museum in 1975. No. 251 continues to be preserved in a static condition as a part of the National Collection. DJH and Nu-Cast both produce whitemetal kits of the C1 Atlantic for OO gauge (4mm scale). K's Kits have also produced a 4mm scale kit, but this is no longer available. A tinplate O gauge model thought to date from the 1930s operates at the Brighton Toy and Model Museum. Thank you to Mike Morant Collection for the colour illustration of Ivatt C1 No. 1439. Thank you to Malcolm Peirson for the photograph of LNER No. 3277. Thank you to Peter Langsdale for the photograph of C1 No. 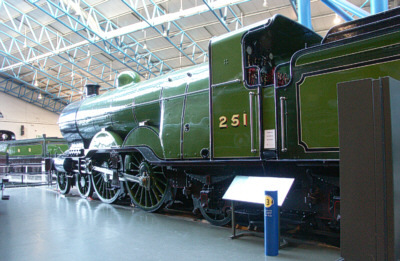 251 preserved at the National Railway Museum.